A fierce competition exists among the different web browsers for market share and right now Internet Explorer, Mozilla Firefox and Google Chrome are in the top three. 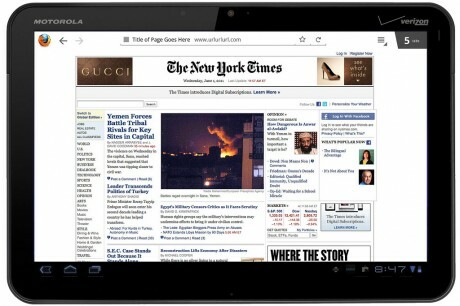 Fans of the popular open source browser Firefox will be happy to hear that the Mozilla team has started development of their mobile browser, Fennec, specifically for Android based tablets. The aim of the team is to release Fennec, together with Firefox 8, and provide a TabletUI, working with Android tablets using Honeycomb (or higher). The work page already includes links to UI mockups, which we added below. Work is on-going and the crew hopes to be able to release the final UI early in the development cycle of Firefox 8, which is scheduled for this year. Google Helping Firefox Dethrone IE? Microsoft’s days of dominance are quickly coming to a close as StatCounter has announced that the software giant has lost the gold to an old nemesis. However what’s surprising about StatCounter’s report is not who inherited the gold, but rather who is really killing off IE in the EU. The firm’s research armÂ StatCounter Global Stats reports that in December, Firefox took 38.11% of European market share, compared to IE’s 37.52%. Despite unveiling Internet Explorer 9 to the masses, Microsoft has been unable to slow the bleeding as more and more users are defecting towards Google Chrome which is considered not only faster than its rivals, but safer as well. While Mozilla (the organization behind Firefox) is probably thrilled at inheriting the gold away from IE, the company needs to figure out a way to increase the popularity of their browser lest they suffer the same fate as Microsoft in a few years. Although it’s only for February, still we could not discount the fact that Google is slowly gaining grounds in the web browser market with the continously improving Chrome browser. Want proof? The latest data collected by Net Applications, a web metrics company is showing that for Google Chrome is the only browser that made some gains in February. 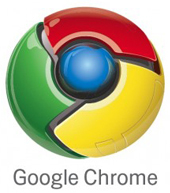 Google Chrome registered an increase of 5.61% in market share from January’s 5.22%, up by 0.39%. Although it’s market share is still not big enough at 0.96% share, still this quite an achievement for Google Chrome, considering that it came late into the web browser party. Even more interesting is the fact that all of its rival showed a slight decrease in market share during February. Internet Explorer, the top no. 1 browser to date got a decrease in market share of 0.54% from January with 61.58% share in February. Firefox, Safari and Opera also have their market share falling down to 0.20%, 0.08% and 0.03% respectively. 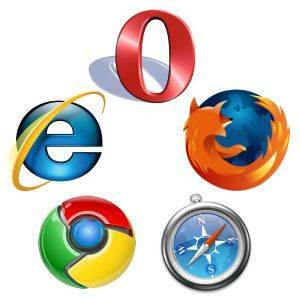 Firefox market share is now at 24.23%, Safari at 4.45% and Opera at 2.35%. Again, it’s a minimal increase and Google has a long way to go to make Chrome browser overtakes or even be at par with both IE and Firefox, but given Google’s marketing strategy plus its continuing effort to enhance Chrome browser, it will just be a matter of time before it becomes a powerful contender in the web browser wars.